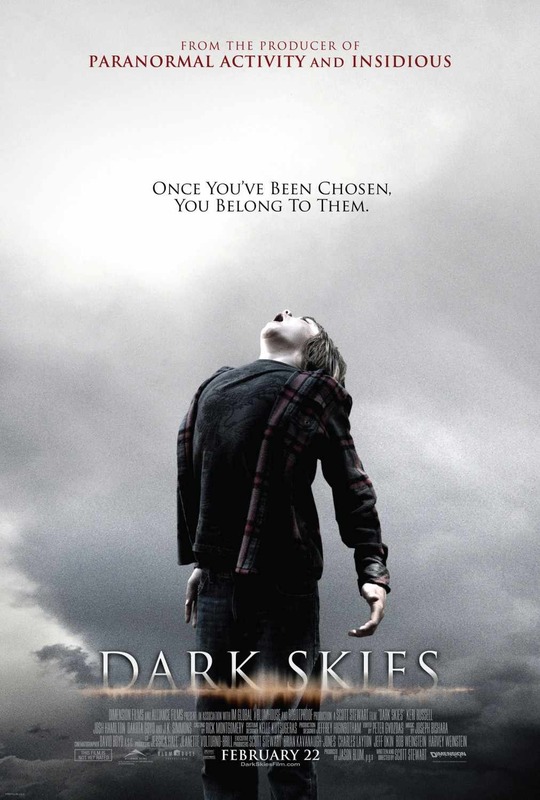 “Dark Skies.” That’s what they call February, where they dump movies like – “Dark Skies.” With the tagline, “Once you’ve been chosen, you belong to them,” I did not know if I was going to see a movie or a Taylor Swift video. The movie stars Keri Russell ( Waitress, Felicity) as Lacy, a mother of two young boys trying to keep her family together. She’s married to Daniel (Josh Hamilton of See Girl Run) and the only time I felt horrified in this movie was seeing Keri Russell climb into bed and only be interested in her laptop. I almost ran out screaming right then and there. Daniel and Lacy are struggling to get by when strange things start happening around the house. I know it sounds a little like “Poltergeist.” The only similarity is a young family in the suburbs where something evil comes into the house, someone says “they’re here,” and it wants to take one of the kids so they seek out this old creepy person to help them? I should give writer, director Scott Stewart (Legion) the credit he deserves for his special twists since he made the kid a boy, and the creepy person a guy played by the great J.K. Simmons (Juno). Pretty soon this nice family is all boarded up in their house and the only thing they have is a script that tells them to scream when bad things happen. None of the characters drive the plot, have an arc, or an heroic moment. Maybe someone can still be saved, like you from letting them get your 10 bucks for this movie. If you are going to steal – steal from the best. I think Stewart wanted to do a movie with less special effects, and he has accomplished that as this movie has less effects and it’s less special. What he needs to work on is some original stories and character development and have something more for Simmons to do than just sit in a chair and tell stories. Tell a new story Mr. Stewart, and don’t try to scare us with the ones our old friend, Spielberg used to tell. I wanted to like “Dark Skies,” and I wanted Keri Russell to bake me a pie like she did in “Waitress,” but neither of those things happened. I give this movie 1 out 5 stars because it’s not worth the effort it takes to type a fraction.